In the Spirit of Reconciliation this garden is a contemplative place where our community can pause, reflect and remember. Elders from both Saugeen First Nation and Chippewas of Nawash worked together with other volunteers in and around Owen Sound to create this space that is to be unvailed this year at the Maawanji’iding: Festival Canadiana to take place during the Canada 150 celebrations. 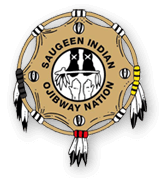 Owen Sound was once a settlement of the Saugeen Ojibway Nation (Saugeen First Nation and Chippewas of Nawash collectively) as history tells us that the banks of the Sydenham and Potawatomie were once the fertile hunting and fishing grounds for our people. This land, however, in Treaty 82 (1857, also known as the Nawash Reserve at Owen Sound) outlines the terms and conditions for the expulsion of the Chippewas of Nawash from their traditional lands and later their resettlement in Neyaashiinigmiing at Cape Croker. This Treaty is currently being displayed in the Betwixt & Between: An Untold Tom Thompson Story exhibit at the Tom Thompson Museum in Owen Sound until September 10 2017.